Located between Mt. Irvine and Black Rock there’s a bay that’s remote as can be in the more touristic part of Tobago. Maybe because it has a reputation of tourist being robbed here in the past, or because the entrance does not mark anything. (it’s not much more than a little track in between some squatted gardens). Or it might be that a lot of Tobagonians use it as their their love retreat and rather keep this a secret. 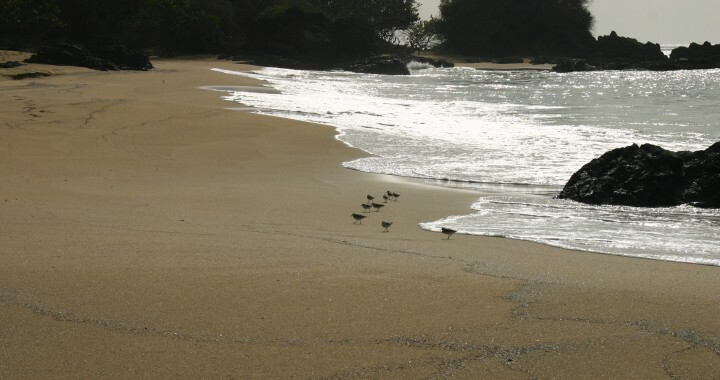 Whatever the reason this beach is so quit, it is one of the most stunning beaches Tobago has to offer. Recently cleaned bu seapep and with no bars or restaurants you have some miles of beach with rocks and palmtrees to yourself. If it already has more people than yourself it will be the opposite of Pigeon Point or other beaches. A sailboat passing by or some boys going fishing is all we have seen spending an afternoon on this beach. Walking on the rocks – either to the left or the right side of the beach – you can literally see the fish pass by in the crystal clear water. No glass bottom boat needed here. If you go in the water here be careful for sea ​​urchins – like everywhere where there are rocks -. Check the slideshow and decide for yourself ! ← Tobago Today now has a newsletter !